Get next year off to a good start by including these routines each morning, especially in kindergarten through 2nd grade. 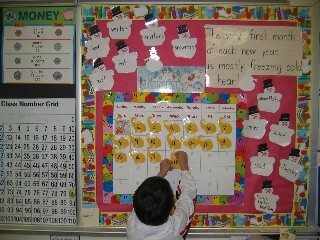 Students develop calendar, place value, money, time and data collection skills through these daily routines. Classroom management: First and second graders may be assigned different routines to perform as they arrive in the morning. They then report back to the class during the designated morning routine class period, leading the class in counting, recitation of the date, counting money, etc. This daily practice provides ongoing assessment for teachers as they observe student participation. See Morning Routines for descriptions of these routines and to download files. 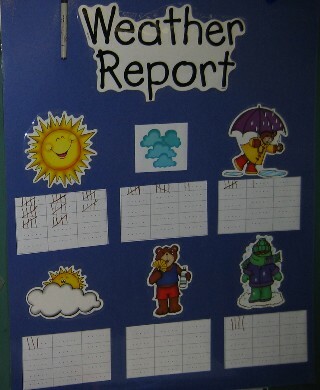 See Morning Routines Photo Galleryfor photos of actual classroom posters. Added on 6/12/06: Money Activities & Strategies designed to help students practice and learn money skills. 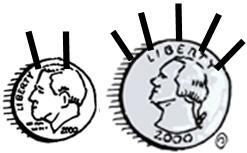 This new webpage explains suggested strategies such as the use of coin antennas (pictured on right). It also includes the new Clean Up the Money! game, a suggested Who Has? Coins deck sequence and internet links for additional money games online. See Morning Routines Photo Gallery for photos of actual classroom posters. Teachers use a variety of formats and classroom groupings of these important morning math routines. This photo gallery provides a range of possibilities. See Morning Routines for descriptions of these routines and to download files for some of the mini-posters. Decimal Place Value allows students to write decimals to the thousandths place. This template is useful for decimal dictation and allows teacher to see if students can correctly write the decimals they hear. The template can also be used to dictate digits for specific place values, then ask students to read and/or write the resulting decimal. See Build a Decimal for an additional decimal place value activity that actively involves students in reading and writing decimals to develop and practice decimal place value concepts. These decks were formatted to print on 2x4 inch label sheets. Labels can then be affixed to index cards to create quick classroom decks. Each deck is 30 cards. Who Has? Multiplication Deck C practices the 2, 5 and 10 times tables. Who Has? 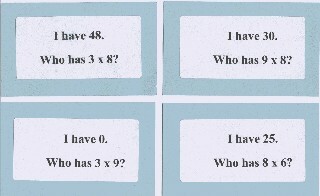 Multiplication Deck D practices the 0, 1 and 2 times tables. See additional Who Has? Decks designed to practice different math concepts. This Mathwire.com webpage includes classroom management suggestions as well as variations for playing Who Has? as a whole class or as small groups.